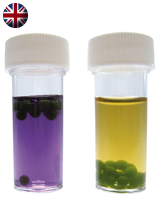 Students immobilise algae in calcium alginate, then use the entrapped cells to study photosynthesis by placing them in hydrogencarbonate indicator solution and observing the colour change as the carbon dioxide is depleted. Basic understanding of the biochemistry of photosynthesis. Knowledge of pH scale and the use of indicators. Sodium alginate; Hydrogencarbonate indicator; Culture of algae. A colorimeter is useful, but not essential. Used with students aged 14–16. Also suitable for older students, particularly if open-ended investigations are undertaken. Sodium alginate is available from suppliers of laboratory chemicals (it is also widely used in the food industry). Suppliers of other resources are listed in the protocol. The NCBE will soon supply a kit for undertaking this work. Similar arrangements may exist in other countries.